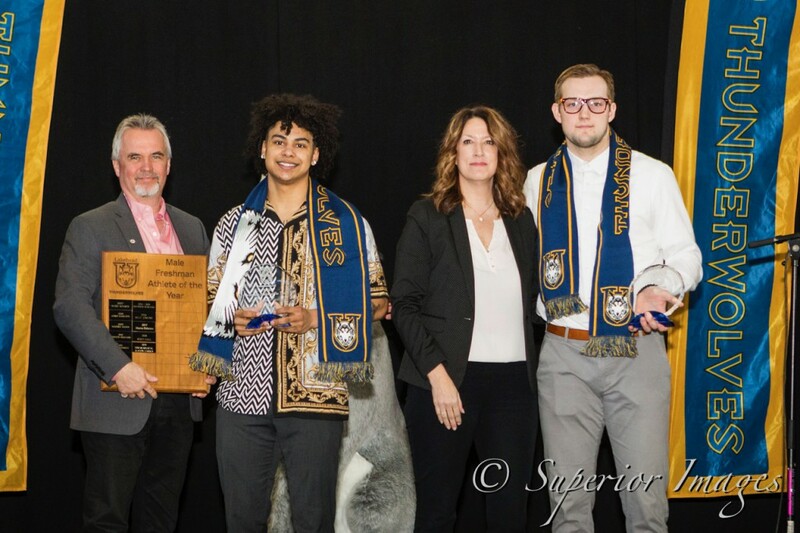 The Lakehead Thunderwolves Athletics family celebrated the 2018/2019 this afternoon by handing out their awards at the Annual Awards Gala. Leashja Grant of the women’s basketball team earned the Female Athlete of the Year award and Wrestling’s Marco Palermo walked away with the Male Athlete of the Year award. Grant, who hails from Nassau, Bahamas, picked up her second straight Female Athlete of the Year award to go along with her second consecutive Women’s Basketball MVP, OUA Player of the Year, and USPORTS 1st Team All-Canadian awards. “This amazing player has left her mark on the OUA & USPORTS like very few before her,” women’s basketball coach Jon Kreiner said. Leashja was the leading scorer and rebounder in the OUA and improved her passing & defense this year to rank among the leaders in the league. She helped push her team to 6th in the national rankings at year’s end and a 20-4 league record. 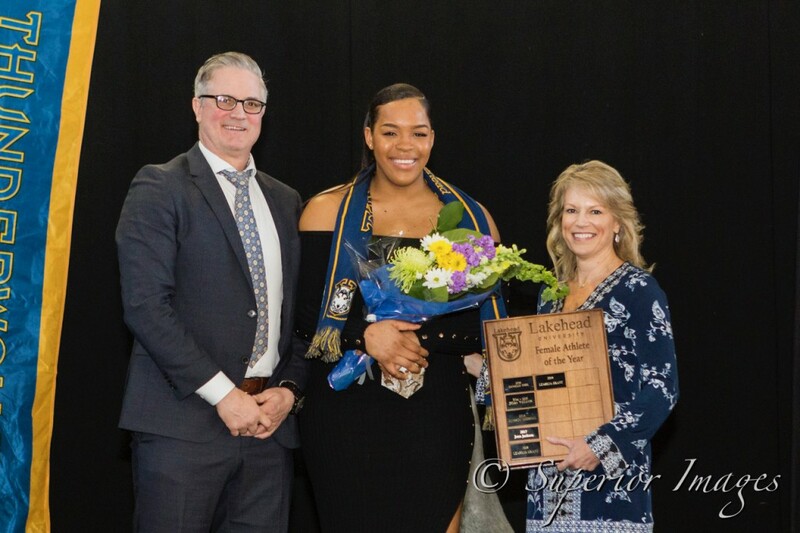 In addition to the Female Athlete of the Year, Leashja Grant also received the Argus Award, an award given yearly to an athlete of exceptional skill who captured the attention of media throughout the year. 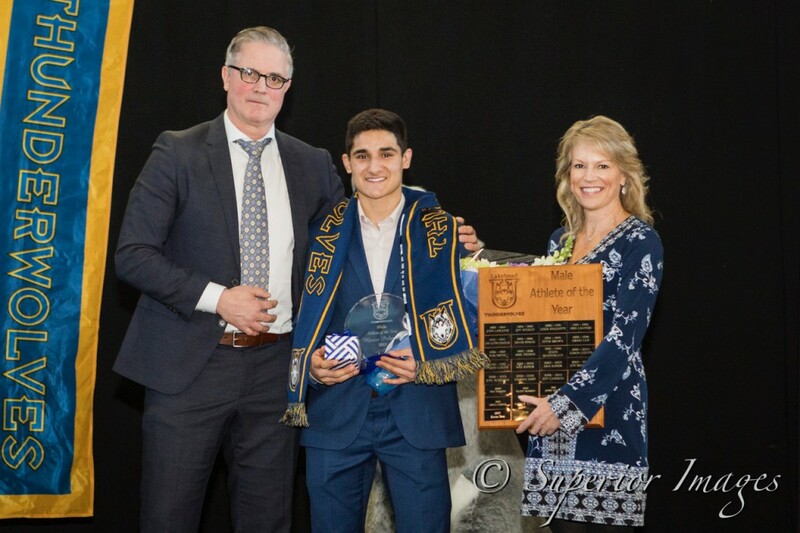 Palermo, a Thunder Bay native, picks up his second consecutive Male Athlete of the Year award after receiving the Male Rookie of the Year award two seasons ago. Marco won gold medals at both OUA and USPORTS championships this year, adding to an already impressive pile of medals that already includes previous USPORTS gold. The Nordic skiing team’s Shaylynn Loewen of Parry Sound, Ontario received this year’s Female Rookie of the Year award. Loewen was part of the women’s Nordic team that won this year’s national CCUNC championship. She also earned an individual bronze medal in the individual start freestyle race at her first OUA Championships, skied anchor to bring home gold in the women’s team relay event at the OUA Championships, and was victorious in the women’s sprint race at the Canada Winter Games in Red Deer, Alberta. The Male Rookie of the Year award was shared between two athletes: men’s basketball’s Alston Harris of Ottawa, Ontario and men’s hockey’s Tomas Soustal of Sternberk, Czech Republic. Harris led first-year men’s basketball players in minutes played, points scored, rebounds, assists, and steals, holding averages of 8.5 PPG, 2.3 APG and 1.8 RPG. 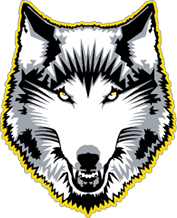 “He is a natural leader who holds himself and his teammates accountable,” men’s basketball coach Ryan Thomson said. Soustal, meanwhile, scored 14 points in 18 OUA games, contributing in all situations including power play and penalty kill. “Tomas has the opportunity to be a top player in the OUA and USPORTS if he continues the progression pattern that occurred his rookie season,” men’s hockey coach Andrew Wilkins said. 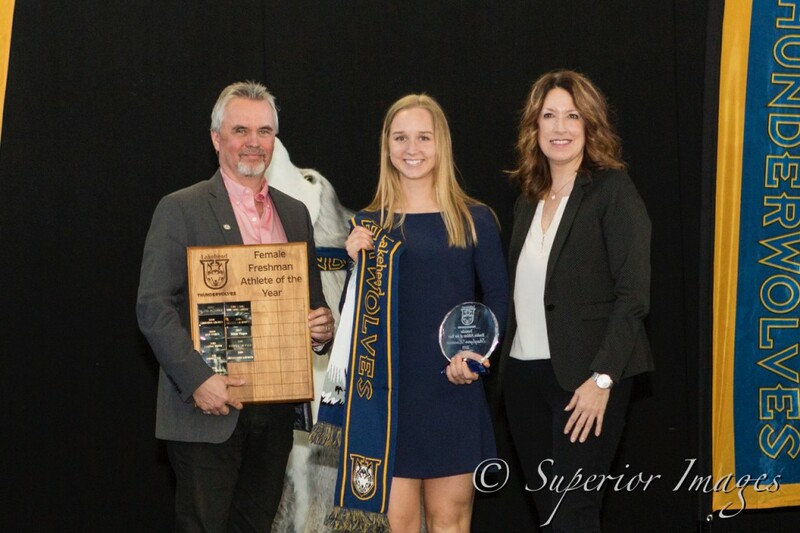 The Hank Akervall Memorial Award went to women’s volleyball’s Jessica Korchak of Thunder Bay, Ontario and men’s basketball’s Nick Burke of Hamilton, Ontario for being well-rounded individuals who achieved academic excellence as graduating athletes while also being senior leaders and prominent members of our community.